As my 19th birthday is fast approaching, I thought I'd make a quick little wishlist post to share some of the items I've been drooling over recently! I've included links to each item below the picture, and as I am writing this, everything still seems to be in stock! Maybe they'll help inspire your own Christmas wishlist, or give you an idea for a friend? What are you doing for you birthday?! That coat is to die for! I saw it on sale for like £45-£50 in Chichester the other day, Zara also have a lovely one too. I definitely need to invest in some gloves this year...and a hat! NO WAY??!!! Oh my goodness! If they still have it next time you go, can I PayPal you the money??! That's amazing! 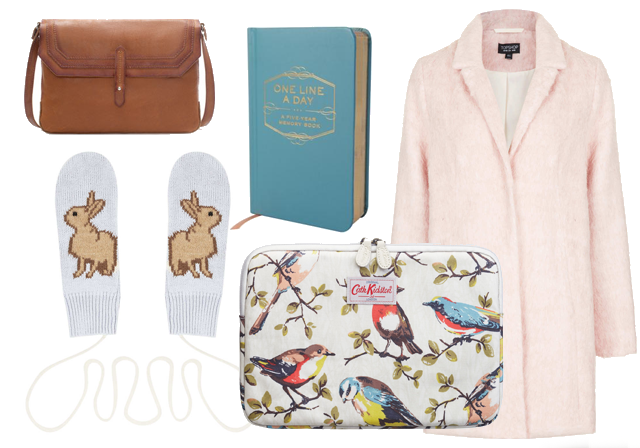 Such a lovely wish list - the messenger bag is beautiful and the mittens are so cute! :) It's my birthday next month so I'll need to start compiling a wishlist soon.